Yesterday, I was surfing on the Internet when I found an interview with an astrologer who said to fear the Grand Cross of April, and particularly on April 15 and in the USA. I was confused. There is no Grand Cross in April. Then I realized that it was about the Grand Cross of April 2014. On April 15 the Grand Cross wasn't exact. I think that 'April 15' was mentioned because of the lunar eclipse (visible in the America's and Australia/New Zeeland only). Well, on April 15, 2014 there was no catastrophe in the USA (not a natural one and neither in politics) but there is always one somewhere. This time, in Africa, Boko Haram abducted hundreds of girls and ruined their and their family's lives. The day after there was a disaster with a cruise ship in Korea. But nothing that changed the world in the USA. The aspect reflects tension, but not necessarily an event of Grand Importance on the specific day. However, here is some nuance: big events have a long shadow ahead. Charts of Astrological New Year and the First New Moon of the year, carry information about the months ahead. So it was in 2014. The chart had Mars opposition Eris and Eris inconjunct Saturn. It is not a pleasant chart. In April of 2014, I wrote about the Grand Square (or Grand Cross) hitting the chart of Vladimir Putin in 2014. He is still around, and there is still the danger of a growing conflict in Europe as his troops and the troops of NATO keep testing at the edge of dangerous borders. In 2014 he conquered Crimia. Grand Crosses may not directly ‘inflict’ or ‘cause’ international catastrophes, but there is tension and that shows. So don’t expect the catastrophe to start at the very moment of the aspect, but be aware of what happens next, especially in regions of tension and (more personal) when you are in a stressful situation. Grand Crosses are rare and so are catastrophes, but they don’t necessarily occur at the same moment. The Grand Cross of April 2014 for me personally didn’t bring much tension. I was preparing for a holiday. The degrees didn’t ‘hit’ my chart. If it hit yours, tension might have thrown a shadow ahead for the next period in 2014.
conjunctions of Mars and Eris every (about) 2 year and that doesn’t start a World War. There are military conflicts going on all the time. Conflicts don’t need a Mars conjunct Eris to begin. 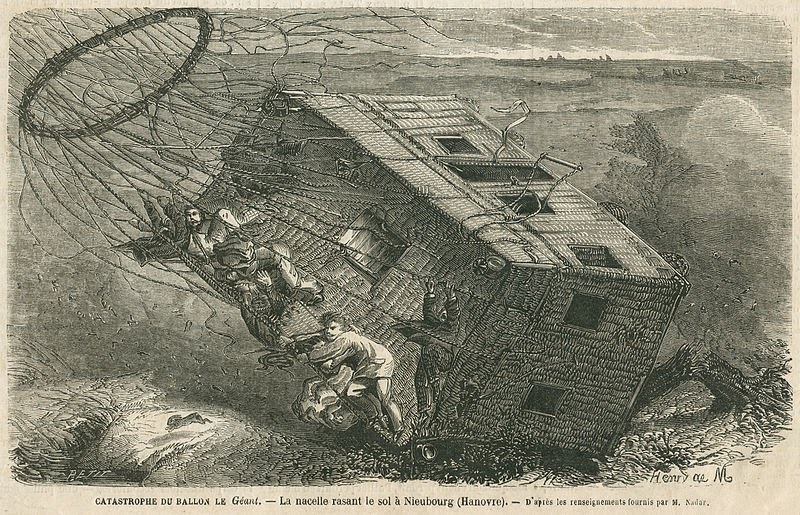 I added the picture of the balloon catastrophe by Henry de Montauk, Petit (19th Century) because of the square shape, the catastrophe and because balloons are in the sky, like Grand Crosses. Did you know that Mars and Eris were on the angles of the chart of Pearl Harbor? **) Maybe a good idea for a joint study, anyone? ***) http://www.island.lk/index.php?page_cat=article-details&page=article-details&code_title=121720 April 23, 2015 seems to be an important date for India politics. I am not into India politics, but I like to mention this article that links astrology and offerings to politics.